A location. The existing house was built in the 1980s and is at the centre of land situated beneath the road. The position enables visitors to tower above the property, revealing it only partially thanks to the dense vegetation. Our first step is to exploit the location setting by creating a path, so visitors can be accompanied and the location revealed gradually in the form of visual progression. To our mind the landscape approach is fundamental and closely linked to the architecture - these two aspects mingle together and intertwine, they are mutually enriching and help to create a sense of wellbeing within us. An internal/external limit is a concept that fills us with passion, both in the art of living and the perception it arouses. Living in a house makes it possible to engage with this peace and the surrounding nature on a daily basis. Our aim was to provide the family with a small comfortable habitat immersed in an oasis of peace. Contrast falls within the remit of our work - contrasting shapes, colours, materials and light. The first noticeable contrast concerns the vegetation. Owing to its position, the house splits the land into 2 parts with clearly distinct features - the northern end has tall pine trees that create an undergrowth effect, revealing the house's 3 arrangements via the creative roofing. Only the central arrangement opens up to us, with an inverted roof slope. To reinforce this sensation, the architectural approach that guided a large part of the design was the creation of a strong line that crosses the plot and the house from one side to the other. This accompanies the visitor in the discovery of the location through to the lower end of the garden to the south, offering a spectacular view of the town and its surroundings. This strong line is expressed in various ways depending on the arrangement. A natural carpet can trigger this line in the form of horizontal plateaus detached from the land, a vertical break through the front of the entrance with the creative use of proportions and materials. This façade melts into one at visitor level. Then the half-open door, which splits the dry stone wall, reveals the second part of the landscape by framing the outside fantastically. 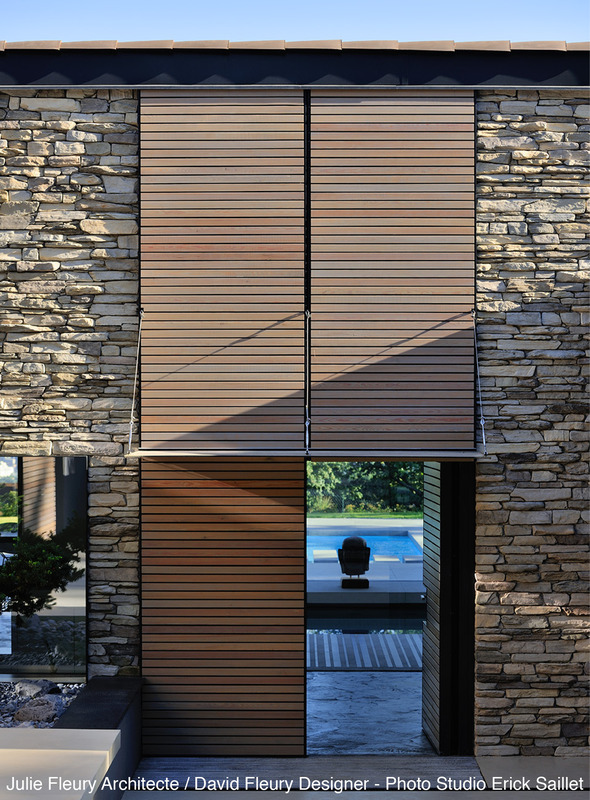 Your gaze is guided in the direction of the water, the heart of the house at the end of the outdoor water feature, passing by the indoor spa, where the Geopietra wall is mirrored. 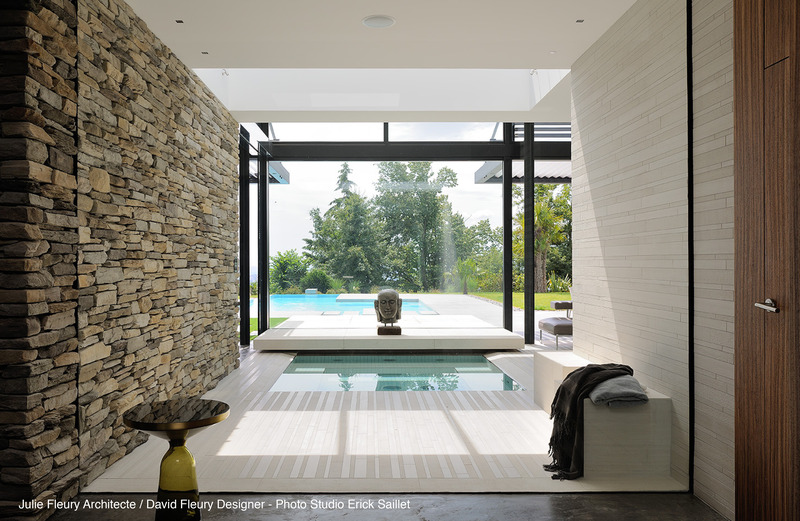 Physically, visitors can’t get near the water though; the fixed glazing curiously forces you to go beyond this trajectory to discover the internal volumes of the house. The creative use of volumes and materials accompany the journey. The impression we had during our first visit to the house was a sense of focus, despite the presence of large windows facing out onto a view as far as the eye can see. We analysed it because it links to the internal shape of the volume. The sloping ceiling provided ample height inside, which decreased at the façade. The architectural approach was to split the house into 2 and reverse the direction of the roof, creating a glass façade 4 metres in height to the south. On the upper level we decided to open the façade up to the panorama, creating a large sunken terrace with a stunning view set in the heart of the house. An encounter. The owners' art of living is instrumental in the design. We like to spend time listening to future occupants, hearing about their habits, tastes, wishes and needs. The draft we produce transpires from experiencing a location, the information provided by the client, and our own sensitivity. We feel the human relationship is fundamental. We have to gain an insight into people's lives to best meet their expectations, which are sometimes unknown. This is evident in the internal arrangement of living areas. The requirement was to work on the modularity of the living space adjacent to the main room, to isolate some areas and create volumes with different shapes depending on the room's use. One part of the room can be connected to the main apartment, the lounge can be very open-plan, or an intimate setting can be created by the fire. 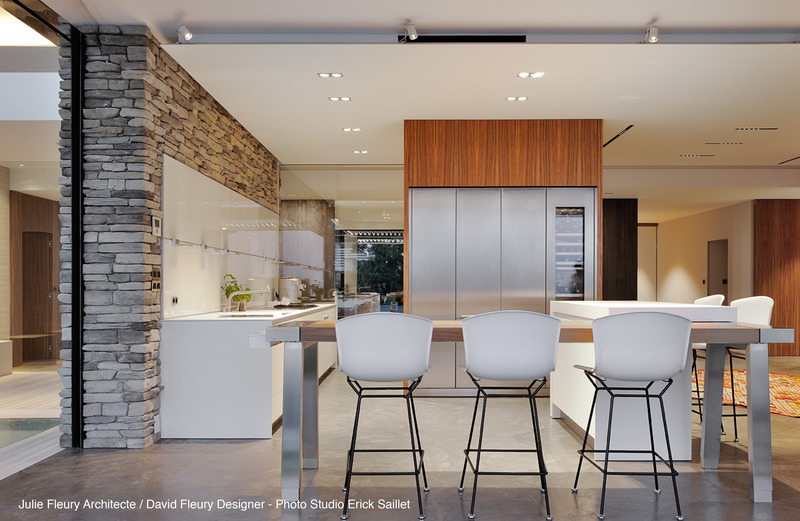 These variations are possible thanks to a set of mobile walls, pivoting doors, sliding doors and glass walls with fabric inserts. The creative use of mirrors reinforces the main thoroughfare and the deconstruction of the space. 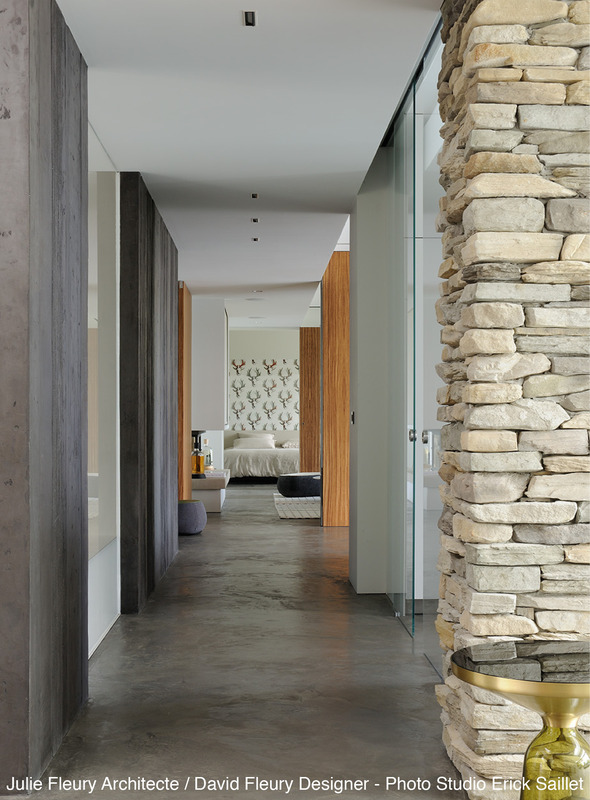 The stone walls had to be in perfect harmony with the interior of the house when entering the apartment from outside. This was possible thanks to the company Geopietra, which provides technically guaranteed stone wall solutions with beautiful shapes and colours. 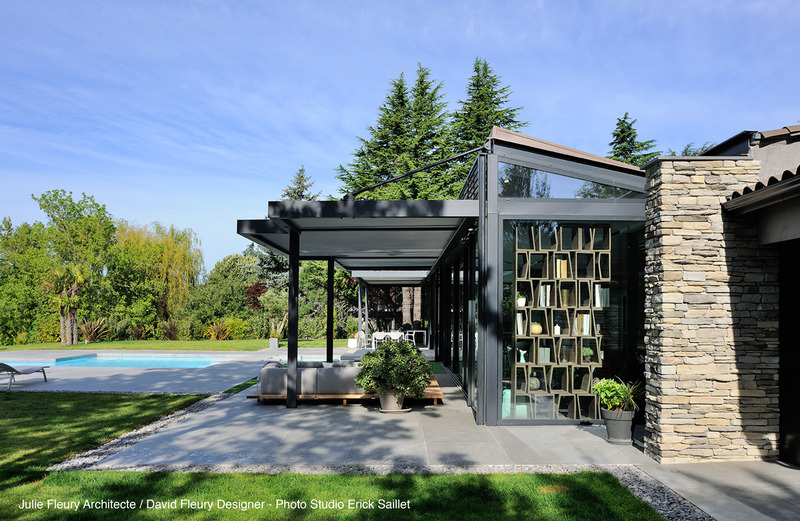 The glass façade with large sliding frames can virtually open its entire length, making the indoor/outdoor limit less defined in summer. The façade is suspended from an overhanging metal structure made of tall, criss-crossed, slender masts staggered inside the house. This opening is accompanied by a bioclimatic pergola with adjustable masts and we adapted this structure. Some masts were removed thanks to the installation of collar ties, making the structure more airy and freeing up some space. This idea of lightness is our guideline when implementing the materials that we work with. The outdoor pool was created with this in mind. 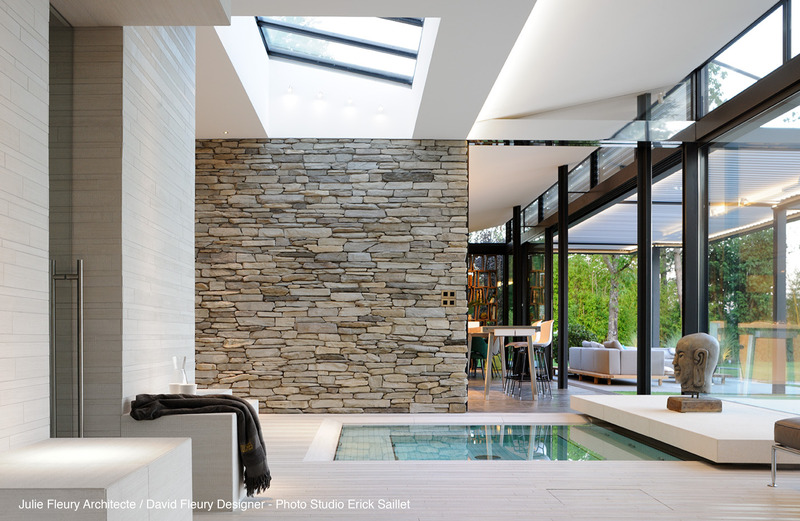 The pool edge effect had to be avoided in favour of large stone slabs hanging over the water. The water comes to life and runs to the end of the overflowing pool, and the staggered steps seem to float on this moving water. It's always surprising to see the complexity of technical details in more aesthetically sophisticated projects. Understanding materials, mastering assemblies, the anticipation and technical research enrich our designs over time. Materials. Texture. Illumination. Light. It is the connection between these elements that brings our projects to life. They're essential for creating a frame of mind and experimenting with every area of a house. Hot, cold, smooth, rough, opaque, clear. Wood, stone, cement, metal, glass, fabric. It's a question of relationships and proportions.